What's your interpretation of this EKG, and what's on your differential? To whom of the above three patients does this most likely belong? This EKG belonged to the patient who fell off a 10 ft. ladder and sustained head trauma. In addition to the sinus bradycardia, subtle U-waves can be seen in leads II, III, and V3-V5. U waves are rather nonspecific, and can be present in healthy individuals as well as patients with acute pathology. The differential for the presence of a prominent U-wave includes hypokalemia, hypomagnesemia, hypocalcemia, hypothermia, Class IA and III anti-arrhythmic drugs, digitalis, and acute intracranial pathology . An inverted U-wave in the precordial leads can be a sign of left anterior descending coronary artery occlusion. U-waves are more prominent when patients are bradycardic . In this case, the patient was subsequently diagnosed with a subdural hemorrhage on CT scan. Bayés de Luna A, Goldwasser D, Fiol M, Bayés-Genis A. SURFACE ELECTROCARDIOGRAPHY. In: Fuster V, Harrington RA, Narula J, Eapen ZJ. eds.Hurst's The Heart, 14e New York, NY: McGraw-Hill; . http://accessmedicine.mhmedical.com/content.aspx?bookid=2046&sectionid=176550544. Accessed January 20, 2018. A 28-year-old male with a history of ADHD presents with two weeks of worsening intermittent chest pain. He describes his pain as a sharp, shooting pain that radiates to his left arm and into his left jaw. When he has the pain, he becomes diaphoretic and short of breath. These episodes last for about ten minutes; they are not provoked by activity and occur at random, even when he is at rest. Over the last two weeks, the frequency of pain as well as the intensity have increased until this morning, at which point he became concerned that it was something more severe. He believes that his grandfather died of a “heart attack” in his late 30s. He denies drug use other than prescribed Ritalin for ADHD, but admits to smoking a pack of cigarettes a day. His initial vital signs are remarkable only for a heart rate of 100. His physical exam is unremarkable. Ritalin, or methylphenidate, is an amphetamine stimulant which is widely used in the treatment of adult and adolescent patients with ADHD. Amphetamines have a high abuse potential and are associated with well-known mild adverse effects such as dry mouth, weight loss, and appetite suppression. What is more worrisome (but not as widely recognized) is that amphetamines such as Ritalin can cause myocardial infarction or sudden cardiac death in patients with a history of cardiac disease. In fact, all amphetamines carry an FDA black box warning to this effect. Use of amphetamines causes an increase in circulating catecholamines, which activates beta-1 adrenoreceptors, leading to increased heart rate, as well as alpha-1 adrenoreceptors, then to vasoconstriction and increased blood pressure. This increased demand on the heart is thought to increase the risk of myocardial ischemia in patients who already have coronary artery disease. This may include patients like ours with multiple risk factors for early coronary artery disease, but who have not yet been formally diagnosed. Schelleman et al. found a 1.8-fold increase in risk of sudden death or ventricular arrhythmia in adult patients who initiated methylphenidate therapy. Conversely, a retrospective, population-based study of more than 150,000 adults with prescriptions for methylphenidate, amphetamine, or atomoxetine case-matched to non-users demonstrated a lack of association between stimulant use and incidence of MI, sudden cardiac death, and stroke. Chest pain in an adolescent or young adult who is on a stimulant should prompt a further detailed evaluation of cardiac disease in the family, especially associated with early cardiac death. In addition, lifestyle risk factors such as smoking, alcohol, and obesity should also be evaluated to better profile the risk of stimulant medication on patients who may be at an increased risk for coronary pathology. The patient’s initial EKG shows sinus rhythm without any particular ST segment elevation or depression. However, upon closer inspection, lead V1 and V2 show possible evidence of Wellen's syndrome (better appreciated in post-admission EKG below). Wellen's syndrome is concerning for a proximal LAD stenosis, and manifests as symmetrical T wave inversions in the anterior precordial leads that are often deep (greater than 2 mm) or as biphasic T waves. In the setting of unstable angina, this pattern can predict poor outcomes. Patients who have this finding on their initial EKG (with or without cardiac biomarker elevation) frequently have recurrent angina and may be at high risk of progressing to full myocardial infarction. The patient's post-admission EKG. Wellen's waves are appreciated in V1 and V2. The patient was given aspirin and started on a heparin drip, and admitted to the cardiology service for an ACS rule out and serial troponin monitoring. He continued to have chest pain, with a worsening elevation of his troponin to 0.41. Given his concerning family history and rising biomarkers, Cardiology elected to take him to the cath lab for angiography. Cardiac catheterization revealed an ulcerated LAD plaque with 40 – 50% narrowing, which improved to 50 – 60% after intra-coronary nitroglycerin administration. He underwent stenting of his proximal LAD with 2 drug eluting stents. The Cardiology service felt that the patient’s symptoms had been caused by methylphenidate-induced vasospasm in the setting of pre-existing coronary artery disease. His Ritalin was held, and he was discharged home after a 2-day hospital stay with outpatient cardiology follow up. The patient’s initial lab workup was remarkable for a troponin of 0.05. 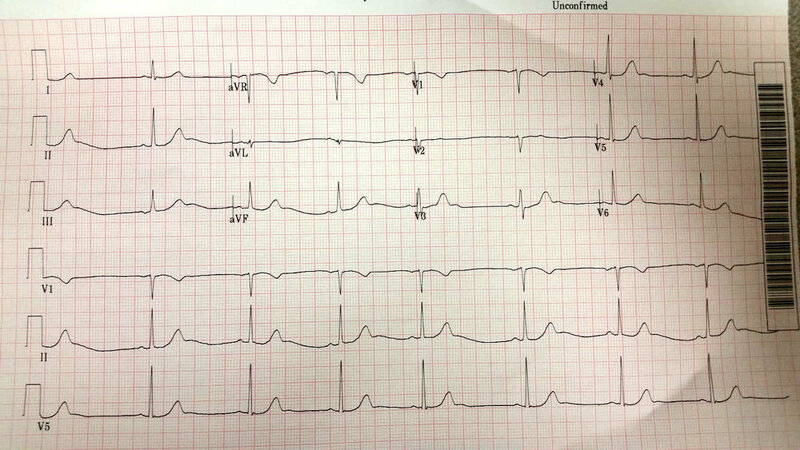 What caused this patient’s chest pain? Leave your comments below, and check back in a week for the case conclusion! A 76 year-old male with a history of severe ischemic cardiomyopathy with an ejection fraction of 15%, atrial fibrillation on coumadin, coronary artery disease, and chronic kidney disease is brought in by paramedics from a skilled nursing facility with confusion, somnolence, and vomiting. Per EMS report, the patient has been vomiting for two or three days. On arrival, the patient’s blood pressure is 128/78 with a heart rate of 130 and oxygen saturation of 99% on room air. On exam, he is oriented to self only. He is slightly agitated but following commands. He has some mild garbled speech and is moving all extremities well. He denies chest pain, dyspnea, or abdominal pain. His extremities are well perfused with intact peripheral pulses and preserved capillary refill. A full set of labs are drawn and pending. A head CT is performed and shows an intracranial hemorrhage and small subarachnoid hemorrhage. Polymorphic ventricular tachycardia (VTach): The patient has multiple risk factors for acute coronary syndrome and known structural heart damage. He is thus at high risk of lethal arrhythmia such as VTach. Atrial fibrillation with aberrancy: The patient has known atrial fibrillation and ischemic cardiomyopathy. He could easily have myocardial scarring that could create a left bundle branch block. His tachycardia could be due to rapid ventricular response, or it could be compensatory due to volume depletion. Atrial fibrillation with preexcitation: Along similar lines, the patient could easily have scarring that could create an accessory conduction pathway. Hyperkalemia: The patient has known chronic kidney disease and is likely dehydrated due to his vomiting. The bizarre QRS morphology and high T waves could suggest hyperkalemia. Before considering treatment options, we need to decide if the patient is stable or unstable. Although the patient is markedly tachycardic, his blood pressure is in the normal range. His mental status is altered, but this is easily explained by his intracranial hemorrhage, and his physical exam suggests that his perfusion is not acutely compromised. We can thus treat this patient as stable, and we do not need to perform immediate electrical cardioversion (although it would be prudent to put the defibrillator pads on, just in case the patient decompensates). Remember: in stable patients with a complex differential, “don’t just do something, stand there” and take your time to consider your options. We have several options for treatment: adenosine, other AV nodal blockers such as beta blockers or calcium channel blockers, and antiarrhythmics such as amiodarone or procainamide. However, given the patient’s complex medical history and the broad differential we outlined above, all of these treatments are problematic in the acute phase. Adenosine can be considered in regular wide-complex tachycardias (WCTs), as it can slow down the heart rate and help unmask the underlying rhythm or accessory pathways. However, in irregular WCTs, blocking the AV-node could increase conduction through an accessory pathway, leading to treatment-resistant refractory tachydysrhythmias. Calcium channel blockers and beta-blockers also have the potential to increase conduction through an accessory pathway. Additionally, they have a negative inotropic effect, which could exacerbate this patient’s already severe heart failure and precipitate cardiopulmonary deterioration. Antiarrhythmics such as procainamide or amiodarone might be a reasonable choice. The American Heart Association recommends amiodarone for stable wide-complex tachycardias, but it can be dangerous in the setting of rapid atrial fibrillation with preexcitation, as it can cause AV nodal blockade. Procainamide has been shown to be effective in all types of wide complex tachycardias, and is the drug of choice in rapid atrial fibrillation with preexcitation. Recent studies have suggested that it might be equivalent or even superior to amiodarone for in VTach. However, it also has negative inotropic effects and is thus dangerous in patients with heart failure. Lidocaine has variable evidence in regards to efficacy of cardioversion, AV-nodal blockade, and inotropic effects, but may be as effective as amiodarone for VTach. Furthermore, administration of any of these sodium channel blocking agents could be dangerous if the patient truly is hyperkalemic, as severe hyperkalemia can potentiate sodium channel blockade and induce asystole. There is no ideal answer for this patient given his co-morbidities and the severity of his heart failure. The safest choice is probably elective cardioversion. However, cardioversion is frequently unsuccessful in patients with abnormal hear architecture and chronic arrhythmias. If an antiarrhythmic agent must be given, amiodarone is probably the safest choice. Given that the patient is stable, we can likely attend to his other urgent medical problems and await some lab results (specifically, a BMP or whole blood potassium). The patient’s BMP shows a serum potassium of 7.2 and a creatinine of 4.2, suggesting acute renal failure with severe hyperkalemia. Hyperkalemia generally produces a spectrum of ECG findings that classically progress as serum potassium rises. Peaked T-waves (tall and narrow) are often the initial abnormality seen on ECG. P-wave flattening and PR lengthening generally follow; in this case, the patient’s atrial fibrillation precludes evaluation of his (absent) P waves. As the serum potassium level continues to rise, the QRS interval begins to widen. Bizarre QRS morphology develops and can progress into a sine wave pattern in advanced hyperkalemia. Ultimately, this can lead to VFib or asystole. Classic teaching notwithstanding, severity of hyperkalemia is very difficult to evaluate based on EKG alone. Not for nothing is hyperkalemia called “the syphilis of the EKG.” We can, however, identify both high T waves and bizarre widended QRS complexes on this patient’s EKG. The patient was treated with calcium, insulin, and dextrose for acute stabilization. Repeat EKGs (shown below) demonstrated interval normalization of electrical morphology with resolution of acute hyperkalemia. Ultimately, Renal was consulted for acute dialysis, and the patient was admitted to the Neurosurgical ICU for management of his intracranial hemorrhage. Generally, treat wide-complex tachycardias as ventricular tachycardia until proven otherwise, but be suspicious of hyperkalemia in any patient with a wide-complex tachycardia and renal insufficiency. In any unstable patient with a tachydysrhythmia, proceed to emergent cardioversion. In stable patients, don’t be afraid to take some time to consider alternative diagnose and await critical lab results.